I’ve been rummaging through all my old pictures in order to give myself some inspiration as to what to write. 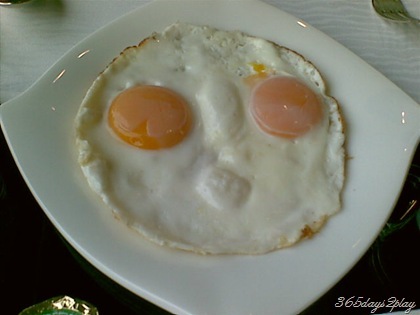 So I came across these egg head pictures. Quite face-like, don’t you think? 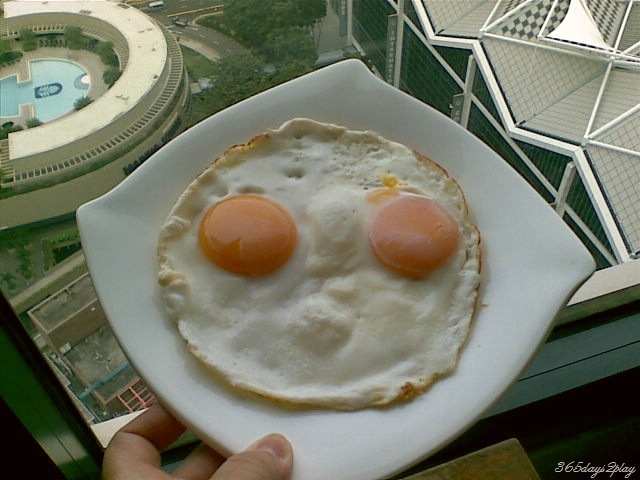 This was what they served me for breakfast when I stayed at the Conrad last year. But I think the best made to order eggs I have ever eaten was at the MovenPick resort in Phuket. Wow, if anyone can just make that omelette for me again! The texture was just right and it was a little runny too for an omelette, which made it taste so good. But just maybe, it had something to do with the eggs. Perhaps they were fresh from the kampongs. Well I am hoping anyway. The other day after leaving the office for lunch, I noticed a crowd of people standing near to the road and not moving. Being the kaypoh that I am, obviously I couldn’t stop myself from looking to see what on earth they were looking at. As I got nearer, I could smell something nasty in the air. Smelt like plastic burning. To my horror delight, I saw a yellow car with the back portion all burnt up! It was still smoking and the smell was so bad, after a few more glances with my breath held, I quickly left. I returned one hour later, and the crowd had pretty much dispersed except for new onlookers every few minutes or so. As you can see from the pictures below, which I took at 1.30pm after lunch, the car was no longer smoking so I took a closer look. 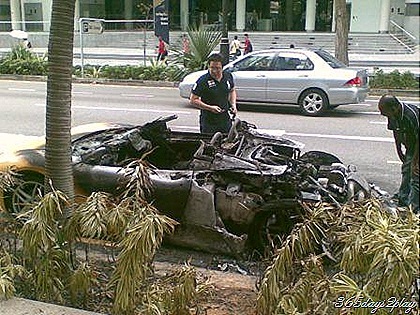 Now I am not one who is crazy over cars, so I had no idea that this was a ferrari which had just gone up in smoke. Still, from the yellow colour, plus the fact it didn’t have a roof, I guessed that it must not be that ordinary a car. This must be quite bad for Ferrari’s image. 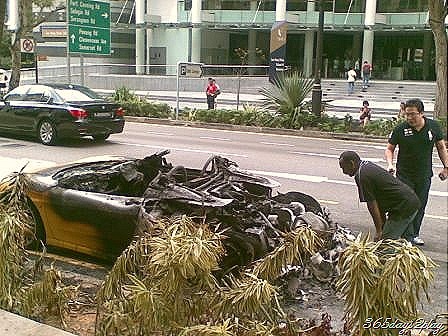 According to the newspapers, the car simply spontaneously burst into flames. This must be a huge safety issue, which requires as much prominence as the Toyota and Honda problems! Would I hesitate to drive a Ferrari from now on if my godfather presents me with one? Hell no! It was the talk of the town back in the office. 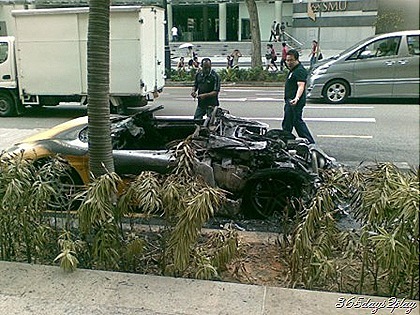 A few people were lamenting the fact that the owner (the newspaper said it was a young man) would be heartbroken if their expensive car was destroyed in such a horrible manner. Nah….I think we can all sleep well knowing that his father would probably have it replaced ASAP. Or maybe Ferrari would give them a brand new one for free as a sign of goodwill.